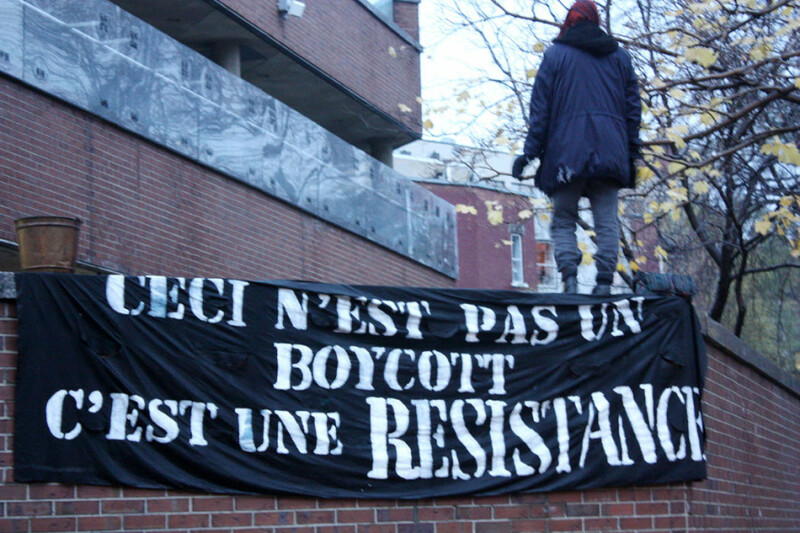 The first day of protesting began early for the student activists meeting at Place des Arts at six a.m. this morning. The Association pour une solidarité syndicale étudiante (ASSÉ) announced four official protests today, starting with the first one at six a.m., which was meant to block Hydro Quebec headquarters, and ending with a general demonstration at 8:45 p.m. at Place Emilie-Gamelin. ASSÉ denounces the cuts to public services undertaken by the provincial government to reduce Quebec’s deficit, according to spokesperson Camille Godbout. “At ASSÉ we feel that there are alternatives to austerity, and by reaching corporations, banks and rich people that are able to contribute it’s perfectly possible to finance public services,” said Godbout. Around 6:45 a.m., about 40 protesters tried to barricade the doors of Hydro-Quebec headquarters, but were immediately pushed away by police, who almost outnumbered them. The group then splintered off, running east towards UQÀM and Cégep du Vieux Montréal. 33,000 students are on strike today to protest provincial austerity measures. Students from Cégep du Vieux Montréal, Cégep de St. Laurent, the anthropology department at Université de Montréal and various associations at UQÀM are not attending courses and will be visiting classrooms to release students from classes throughout the day. Godbout says the government can expect more demonstrations if austerity measures continue. 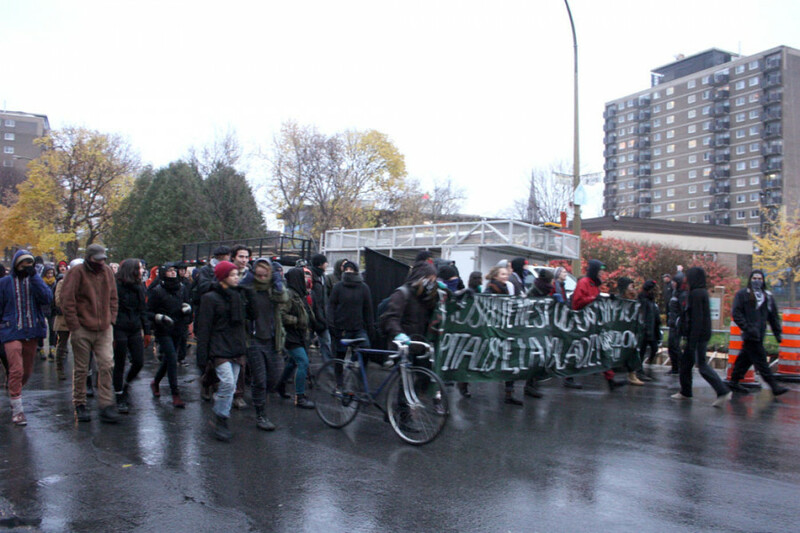 ASSÉ and other student associations—notably students standing outside of the barricaded doors of Cégep du Vieux Montreal and some from UQÀM, which hosted a daytime protest on campus yesterday—made their way toward Place-des-Arts for a second protest around 7:30 a.m. However, that demonstration turned into a sprint as the 40-odd students ran up Ste. Catherine St., were surrounded by rows of police officers and eventually split up. Both protests this morning were declared illegal within minutes for not providing a planned route as prescribed by controversial bylaw P-6 on preventing public disorder. By 8 a.m. protesters were already touching base and organizing disruptions that are going on all day inside UQÀM in solidarity with the strike. At 8:30 a.m. about 15 police officers were seen entering the UQÀM science pavilion, again near Place-des-Arts, after being alerted by security of a suspicious group of students. One policeman was still on his bike. A few of them made it to the third floor, where some students were gathered, apparently as part of the strike, but the policemen left after it was clear the group was not doing anything illegal. “We’re just making sure the situation doesn’t degenerate,” one policeman told students, who responded by calling their presence an intrusion in the university. Meanwhile officers used pepper spray on the first floor of the pavilion after they were surrounded and cornered by demonstrators, according to the Montreal police media representative. The officers used their bikes to protect themselves and left through a nearby door. According to the police, no one was arrested or ticketed, but some people present were seen giving their IDs to police officers, even before the 6 a.m. protest began, according to the ASSÉ spokesperson.